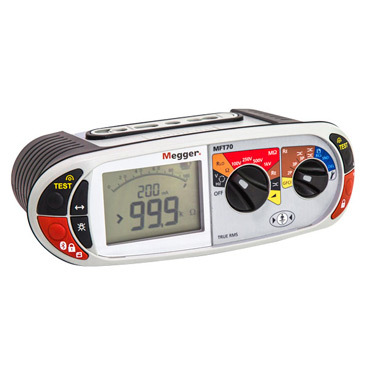 Norristown, Pa. April 2018 – Megger now offers a multi-function tester that tests low voltage electrical installations to fulfill the requirements of NFPA70 and the National Electrical Code. The MFT70 provides all tests required to complete the necessary electrical certification for industrial, commercial and domestic fixed wiring installations. Designed for use by electricians, equipment installers and engineers, lighting installers, testing and certification companies, as well as facilities maintenance companies and micro-generation installers, this new instrument can test for continuity, insulation resistance, ground and GFCI tripping. The battery powered MFT70 can be operated from a ladder-shelf or platform, around the neck, placed on the floor or in the hand. This compact, lightweight multi-function tester features a large backlit display and intuitive color-coded range selection for ease of use, dual function display with simple rotary dials showing all tests available and no hidden menus. Internal memory allows results to be stored on the go and transferred to a Bluetooth-enabled device. The MFT70 is a combined instrument offering a variety of testing options, including ground testing with 2-pole, 3-pole, attached rod technique and stakeless with optional clamps; GFCI testing that meets the requirements of GFCI Type A as defined in the ANSI/UL 943 CSA C22.2 No. 144.1 and ANCE NMX-J-520 as well as perform a ramp test on a 6mA GFCI to ensure it trips under fault conditions; insulation testing at 100 V, 250 V, 500 V and 1000 V; and continuity resistance testing at 200 mA or 15 mA. This tester is designed for harsh environments and reliability. It features a rubber over mold for extra protection and grip, IP54 protection against dust and water and an IEC 61010 CAT IV 300 V safety rating. Each MFT70 includes a 3-wire leadset with probes and clips, test lead, ground test kit with spikes, switch probe, neck strap, batteries calibration certification, quickstart guide and user guide on CD.